This luxurious shaving soap is created with natural clay to give your razor the extra "slip" it needs to glide over the skin effortlessly, allowing you to get the smoothest shave possible. 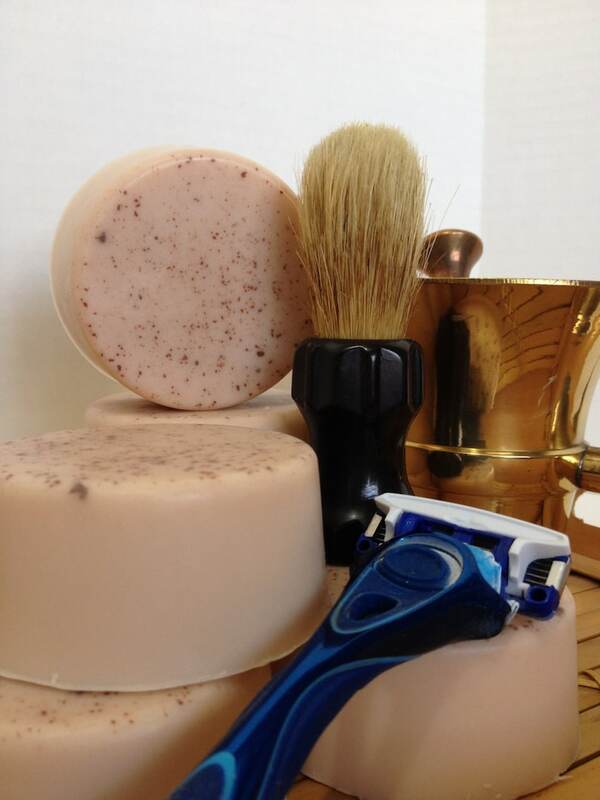 Made with coconut oil, cocoa butter and vitamin e oil to help soothe and moisturize your skin as you shave. **Some people believe you must use a fancy shaving brush to lather shaving soap... that's not true. If you prefer too, please do, we encourage it, however, you do not absolutely need a fancy shaving brush to use this soap. And it can be used by both men and women! Shave your face, shave your legs, shave your entire body if you want! You choose! You can even use this as an all over hand and body soap if you want, it's not just for shaving. Simply wet the soap and using either your hands or a wash cloth, lather gently. A lot goes a long way with this soap and you'll notice that you don't need tons of bubbles before you start to feel the slippery-ness of the clay on your skin. Slather onto the skin until you can feel a thin layer covering the entire area you are shaving. Shave. Rinse. Admire. That's it. If you have dry or sensitive skin, please be sure to moisturize after showering and do not use this product every day to prevent over drying of the skin. You'll also be happy to know that this bar of shaving soap will last you a LOT longer than those expensive cans of shaving cream and gel, with less waste and harm to the environment too! This listing is for one 4 ounce bar of soap. Rustic Sedona, like the city in Arizona, invokes days of old and a deeper, richer experience. The fragrance opens with green notes of mandarin leaf and orange blossom, moving into heady floral middle notes of Bulgarian rose and vetiver. The rich, sensual notes of sandalwood, Bourbon vanilla, amber, labdanum and Tonka bean give full body to this intoxicating fragrance and make it a continued bestseller for both men and women. Wonderful scent; can't wait to use it! The shaving soap has a wonderful scent!